Bill Cosby spoke with CNN’s Don Lemon on September 14 about the underpinnings of underprivileged African American youth. This comes after Lemon’s latest turn to race in America, in due to the recent anniversary of the March on Washington. A renegade for higher education, Cosby spoke with Lemon on parental roles he stated ultimately effect their children’s own future, greatly emphasizing the need to take responsibility of their lives, explicitly men. Unlike his usual comedic demeanor, he held a firm stance on the issues surrounding race and economic onslaught. Cosby interview included candid commentary, stating that the “good things” do not need to be discussed as he quickly backed his statements for the viewers who would be offended by the negative view of African American’s lifestyle. In his interview he addresses the growing rate of imprisoned men, low level of education and increasing need for greater paternal presence in family life. 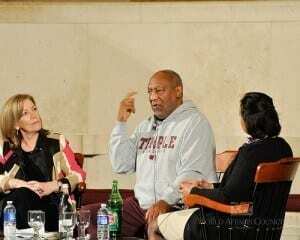 “I think it has to come from the universities,” Cosby begins. “I think, women, strongly because when you see 70%, in research, that says they are the leaders of the household, what we need is for people to realize I want to raise my kid. I want to go back and get my three kids. I want to take on that responsibility. I want to love my children,” he continues as he states the essence of children’s success is the stability of the family including the father. Cosby’s blunt commentary has been highly criticized but neither Cosby nor Lemon has backed down. Cosby is part of the growing number of interviews that Lemon has collected for his renegade of race within America. Lemon has come under attack from various other leaders, including Russell Simmons, who issued an open letter to Lemon.